I thought I'd join in on five on friday again this week! I love seeing new blogs and hearing about everyone's 5 for the week! an (almost) full day at daycare. It's been a difficult transition to daycare, (which we totally knew it would be) so Carter's just been going for the mornings. But it's less than a month til I'm back to teaching full time, so when I picked him up on Tuesday and he was sitting at the lunch table not crying, I knew he had his best day at daycare so far! We're taking small steps so yesterday he stayed through naptime, until 2:30. When I got there it was still naptime and they said that he had a good day! And he slept for about an hour on his mat. WHAT?!?! I seriously couldn't believe it! When I walked in he was laying quietly and awake on his mat. Who is this kid?! I was so happy! Making good progress! Carter got his lunch box and backpack for Christmas and I just ADORE them! We take them everyday to daycare and they're just freaking adorable! They come in so many cute animals, it was tough to choose! You can get the backpacks here and the lunch boxes here. 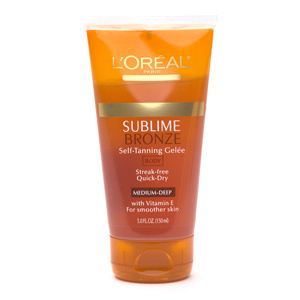 I am SPF-crazy, but my milky-white skin definitely needs some color and for years I've sworn by L'Oreal Sublime Bronze Gelee. I've tried so many different brands and had some pretty traumatic results (hand prints and streaking). But I swear by this one! It's a gel that spreads evenly and looks natural, not orange. Two years ago I couldn't find it in any stores and I thought it was discountinued but I found it online and ordered 5 tubes! It's that good! I live in Pennsylvania where farmstands are everywhere and everything is homegrown and fresh. I totally have not been stopping at them enough. This week I made a caprese lasagna with all locally grown veggies (I add more than just tomatoes) from a sweet little amish roadside stand. I got a bunch of roma tomatoes, blueberries, 2 yellow squash, a zuchini, and baby potatoes for $4.75. Isn't that crazy!? Tonight the leftover tomatoes are being whipped up into Emeril's bruschetta (try this recipe it's so good!) With such great veggies so easily accessible I really don't have an excuse to not eat them all the time. School is on the brain and one of my other major concerns about starting work is that my old clothes don't fit anymore and would fall right off. And I don't think my current uniform of shorts or yoga capris and target tanks and v-necks would really fly with my principal. I've had such a hard time finding pants that fit me and went to many stores looking for basic black or grey capris and pants. I'm a pant girl at school, for sure. I'm constantly up and down and sitting on the carpet. But finally this week I found some pants that fit at the Banana outlet and the J.Crew outlet! I need a little hemming here and there, but at least I have something to wear for the first few weeks. Thanks for reading my five this week! I love Skip Hop! Their stuff is adorable! Glad I found your blog from the link-up! Hope the school year starts off well! Just found your blog through the link up. Those veggies look amazing! So nice you have those all around you. sounds like daycare is going awesome! good luck going back to school. 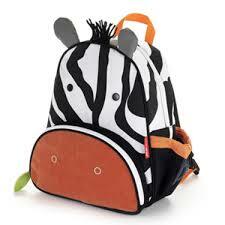 That zebra backpack is ahhh-dorable! Oh, and great tip about the self-tanner. I've been looking high and low for a great one! I love L'Oreals sunless tanners! I've been using their spray kind for several years and it's always worked really well for me! I came over from the link up - your son is too cute! Glad he's adjusting well to daycare! That is awesome progress! 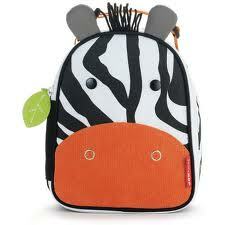 And what a cute backpack! So cute! We love the Skip Hop brand! My son has the doggie backpack. I'm so glad you posted about that bronzer - I've been looking for something like that, but I'm always scared of the outcome I'm going to get :) Excited to try that one! Carter you have come so far! Yay! I just found your blog, and I love it!! I am a teacher and Mom to 13 month old Cameron! :) I can't wait to read more! !